Some things to do for a fiver or less this week. POP QUIZ: If you know your music, try the Rough Trade Pop Quiz at the Lexington. Entry is £1 per team member, quiz starts 8pm. COMEDY: Peep Show’s Isy Suttie headlines Happy Mondays at the Amersham Arms in New Cross, with support from Robert White and Jarlath Regan. Holly Walsh is on MC duties. Entry £5, just turn up, starts 8pm. SONGS: Hear songs about Bishopsgate Parish at Bishopsgate Institutes free lunchtime concert. Free, just turn up for 1.05pm. TRANSPORT: Join a talk putting The Case Against the Car, upstairs at The Yorkshire Grey, Theobalds Road as Street Talks new season gets underway. Free, just turn up for 7pm. CELLO: Take your lunchbreak with some classical music at St James's Piccadilly where Cellissimo play three pieces. Free (suggested donation £3.50) just turn up for 1.30pm. POETRY: Get a sneak preview of a new and pioneering anthology of text artists and poets called The Dark Would with readings and discussion at the Saison Poetry Library at Royal Festival Hall. Free, book your place by email, starts 8pm. ARCHITECTURE: Tonight's Gresham College lecture is Forwards and Backwards: Architecture in inter-war England, looking at the expansion of the suburbs, rise in motoring and the push and pull between modernity and tradition. Free, just turn up at Museum of London, doors 5.30pm, starts 6pm. CARNIVAL: Be at the Rio Carnival Weekender warm up at Guanabara marking the start of six night’s worth of caipirinhas, Brazilian treats and lots of dancing. Entry £5 after 9pm, open 5pm-2.30am. ART: It's First Thursday so go and explore the east London art scene, hop aboard the free art bus or join an arty walking tour. Free, check the website for participating galleries map and more. Open till 9pm. SEWAGE: As the Thames Tunnel controversy rumbles on, find out more about our water and sewage infrastructure and how Thames Water are "rising to the challenge..." at The Adelaide in Teddington. Free, pre-register, starts 7pm. VOLUNTEER: Help Thames 21 with their spring clean up of the Grand Union Canal at Alperton, Brent. Free, just turn up with suitable clothing at the Pleasure Boat Pub at 10.30am. 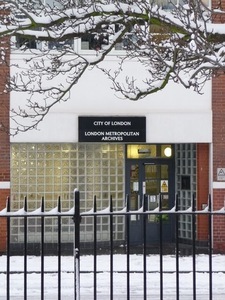 ARCHIVES: It's the monthly Saturday opening of the London Metropolitan Archives so go along and see exhibition Frozen London and explore the fascinating collection while you're there. Free, just turn up, open from 9.30am-4.45pm. HAPPY NEW YEAR: Head for Trafalgar Square and Chinatown for the Chinese New Year Celebrations. The Year of the Snake party starts with a parade at 10am and focus on Trafalgar Square where an afternoon of martial arts, acrobatics and live music (including Emmy the Great) take place. Free, just turn up from noon till 6pm. For lots more ideas have a look at our London For Free page. Photo via London Metropolitan Archives Facebook page.